This cabin approved folding bag is built to last. Folds flat and zips into a handy sized pouch. With 40 litres packing capacity and two easy access front pockets, you will have enough room for all your cabin essentials. 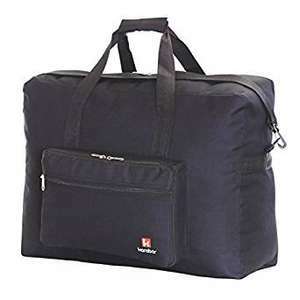 Smart and convenient holdall, perfect for short trips away. 3 Years Warranty! Got a few of these ones from amazon, rubbish seller, but they are fab value for £3! I received this item, but it broke on its first use on holiday. I received a replacement item, at the vendor's suggestion, but that then broke on its first use. I received a third bag, but that too broke (each time the same problem - the shoulder strap breaking at one end and the stitching coming undone at that end) on it's first use, even though I'd only packed 5kg of hand luggage. I finally asked the vendor for a refund, rather than accepting a replacement which would also have been not-fit-for purpose and would simply have broken too; they said as 6 months had passed they couldn't issue one, instead offering a credit note - for what? Further sub-standard goods? It seems the world went mad and any concept of customer goodwill went out of the window, to be replaced by a slavish dedication to 'the rules'. To recap - I received three bags, the one I bought plus two replacements at the vendor's suggestion, each of which were not fit-for-purpose and broke on their first use while packed only with luggage sufficient to qualify as cabin baggage (so 8kg or less, only 5kg on the third occasion). Because I accepted the vendor's suggestion of replacements, 6 months elapsed and now they are refusing my refund request. I will check my consumer rights, because, frankly, this is bulls*** - if I don't get anywhere with Karabar, then I will see if Amazon have any concept of treating their patrons fairly and with respect. DO NOT BUY THIS ITEM. DO NOT BUY FROM THESE PEOPLE. Shockingly poor goods (and service)7 April 2014Colour: …Shockingly poor goods (and service)7 April 2014Colour: Black-Orange|Verified PurchaseI received this item, but it broke on its first use on holiday. I received a replacement item, at the vendor's suggestion, but that then broke on its first use. I received a third bag, but that too broke (each time the same problem - the shoulder strap breaking at one end and the stitching coming undone at that end) on it's first use, even though I'd only packed 5kg of hand luggage.I finally asked the vendor for a refund, rather than accepting a replacement which would also have been not-fit-for purpose and would simply have broken too; they said as 6 months had passed they couldn't issue one, instead offering a credit note - for what? Further sub-standard goods? It seems the world went mad and any concept of customer goodwill went out of the window, to be replaced by a slavish dedication to 'the rules'.To recap - I received three bags, the one I bought plus two replacements at the vendor's suggestion, each of which were not fit-for-purpose and broke on their first use while packed only with luggage sufficient to qualify as cabin baggage (so 8kg or less, only 5kg on the third occasion). Because I accepted the vendor's suggestion of replacements, 6 months elapsed and now they are refusing my refund request. I will check my consumer rights, because, frankly, this is bulls*** - if I don't get anywhere with Karabar, then I will see if Amazon have any concept of treating their patrons fairly and with respect.DO NOT BUY THIS ITEM. DO NOT BUY FROM THESE PEOPLE. 1st review on Amazon not mineShockingly poor goods (and service)7 April …1st review on Amazon not mineShockingly poor goods (and service)7 April 2014Colour: Black-Orange|Verified PurchaseI received this item, but it broke on its first use on holiday. I received a replacement item, at the vendor's suggestion, but that then broke on its first use. I received a third bag, but that too broke (each time the same problem - the shoulder strap breaking at one end and the stitching coming undone at that end) on it's first use, even though I'd only packed 5kg of hand luggage.I finally asked the vendor for a refund, rather than accepting a replacement which would also have been not-fit-for purpose and would simply have broken too; they said as 6 months had passed they couldn't issue one, instead offering a credit note - for what? Further sub-standard goods? It seems the world went mad and any concept of customer goodwill went out of the window, to be replaced by a slavish dedication to 'the rules'.To recap - I received three bags, the one I bought plus two replacements at the vendor's suggestion, each of which were not fit-for-purpose and broke on their first use while packed only with luggage sufficient to qualify as cabin baggage (so 8kg or less, only 5kg on the third occasion). Because I accepted the vendor's suggestion of replacements, 6 months elapsed and now they are refusing my refund request. I will check my consumer rights, because, frankly, this is bulls*** - if I don't get anywhere with Karabar, then I will see if Amazon have any concept of treating their patrons fairly and with respect.DO NOT BUY THIS ITEM. DO NOT BUY FROM THESE PEOPLE. Too much BS effort again. At £3.28 you cant go wrong. Just ordered 2. Strange - when buying one postage is free. When buying two, postage is £6. So placed two separate orders. Seems daft.